I will soon be returning to work after three years in graduate school. Three years turned out to be the exact amount of time needed to convert a wardrobe of trousers and button-downs into one consisting entirely of jeans, t-shirts, and cozy sweaters. Not one item of my school attire was professional enough for the workplace. 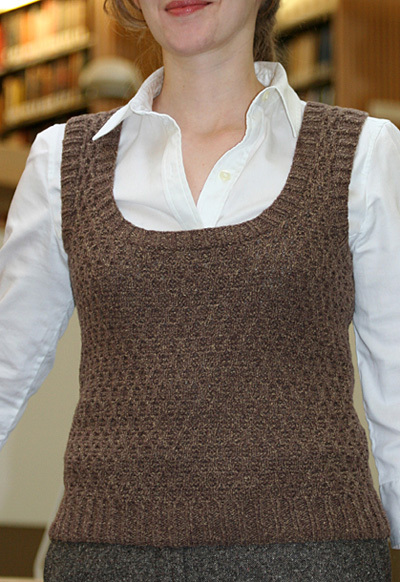 Honeycomb came out of an effort to knit something that would stand up to a formal business environment. The combination of a soft-yet-sophisticated yarn, relatively small needles, and an all-over texture gives this shell a refined feeling. Subtle shaping in the body ensures that Honeycomb looks tailored and flatters the figure, but still has enough room so that a button-down shirt won’t bunch at the waist when worn underneath. 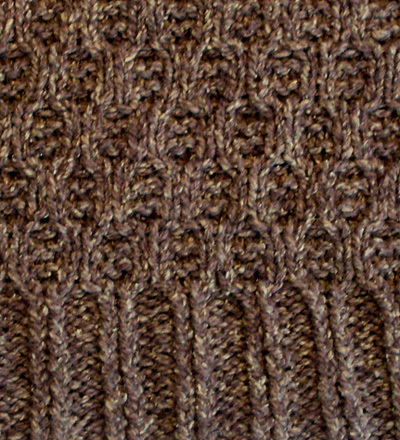 Trims in a twisted rib pattern have just enough definition to set them off from the body of the sweater, as well as allowing for the use of only one needle size for the whole piece. Of course, Honeycomb doesn’t have to be for work only. It’s light enough to wear alone or with a lace-trimmed camisole peeking out the top when the weather turns warm. Important Note: The Honeycomb Cable pattern is very stretchy. 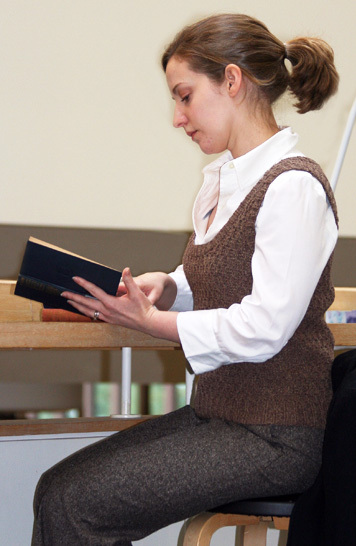 The garment shown is worn with 4 inches of negative ease. Choose a size with a finished chest measurement of approx. 4 inches less than your actual bust measurement. You may find that this piece goes more quickly if you cable without a cable needle. Instructions may be found here. If the 2 sts to be worked together would be a C2F following the pattern, work ssk. If they would be a C2B, work k2tog. If the next st in pattern should be a k st, work k2tog at the beginning of the row, or ssk at the end of the row. If the st should be a p st, work p2tog. The abbreviation used to indicate that the next 2 sts should be worked together is “dec 1 st”. C2B: Slip next st to cable needle and hold to back of work; k1, k1 from cable needle. C2F: Slip next st to cable needle and hold to front of work; k1, k1 from cable needle. P1 tbl: P1 through back loop. Row 1 [RS]: K1, [k1 tbl, p2, k1 tbl] to last st, k1. Row 2 [WS]: P1, [p1 tbl, k2, p1 tbl] to last st, p1. Repeat these 2 rows for Twisted 2x2 Rib. Round 1: [K2 tbl, p2] to end. Repeat this round for Twisted 2x2 Rib. Row 1 [RS]: K1, [C2F, C2B] to last st, k1. Even-Numbered Rows 2-6 [WS]: P1, [k1, p2, k1] to last st, p1. Odd-Numbered Rows 3-5 [RS]: K all sts. Row 7 [RS]: K1, [C2B, C2F] to last st, k1. Even-Numbered Rows 8-12 [WS]: [P2, k2] to last 2 sts, p2. Odd-Numbered Rows 9-11 [RS]: K all sts. Repeat Rows 1-12 for Honeycomb Pattern. Using straight needles or long circular needle, CO 94[106, 122, 134, 146, 162, 174] sts. Work in Twisted 2x2 Rib until work measures 2 inches, ending with a WS row. Work 2 rows in Honeycomb Pattern. Note: See Pattern Notes above re. decreasing in pattern. Decrease Row [RS]: K1, dec 1 st, work in pattern to last 3 sts, dec 1 st, k1. Repeat these 8 rows 3[3, 1, 1, 4, 4, 4] times more. 86[98, 118, 130, 136, 152, 164] sts. Work Decrease Row. Work 5 rows in pattern. Repeat these 6 rows -[-, 2, 2, -, 1, 1] times more. -[-, 112, 124, -, 148, 160] sts. Continue in pattern until work measures 6.75[6.75, 7, 7.25, 7.5, 8, 8] inches, ending with a WS row. Increase Row [RS]: K1, m1, work in pattern to last st, m1, k1. 88[100, 114, 126, 138, 150, 162] sts. Work 5 rows in pattern. Work Increase Row. Repeat these 6 rows -[-, 1, 1, -, 0, 0] time more. -[-, 118, 130, -, 152, 164] sts. Work 7 rows in pattern. Work Increase Row. Repeat these 8 rows 2[2, 1, 1, 3, 4, 4] times more. 94[106, 122, 134, 146, 162, 174] sts. Continue in pattern until work measures 12.5[12.75, 13, 13.5, 14, 14, 14] inches, ending with a WS row. BO 6[6, 8, 8, 8, 8, 8] sts at beginning of next 2[2, 2, 2, 2, 2, 4] rows. 82[94, 106, 118, 130, 146, 142] sts. BO 2[4, 4, 4, 6, 6, 6] sts at beginning of next 2 rows. 78[86, 98, 110, 118, 134, 130] sts. BO -[2, 2, 2, 4, 4, 4] sts at beginning of next -[2, 2, 4, 2, 4, 2] rows. -[82, 94, 102, 110, 118, 122] sts. BO 2 sts at beginning of next -[-, -, -, 2, 2, 4] rows. -[-, -, -, 106, 114, 114] sts. Repeat these 2 rows 3[3, 5, 5, 5, 7, 7] times more. 70[74, 82, 90, 94, 98, 98] sts. Continue in pattern until work measures 6.25[6.5, 7, 7.5, 8, 8.5, 9] inches from beginning of armhole, ending with a RS row. Next Row [WS]: Work 23[23, 27, 27, 31, 31, 31] sts in pattern; attach second ball of yarn and BO next 24[28, 28, 36, 32, 36, 36] sts, continue in pattern to end. 23[23, 27, 27, 31, 31, 31] sts. In the directions that follow, “first half” will refer to the set of sts worked before the gap created by the BO sts at center back. Directions for first half and second half will be separated by a semi-colon. Working both sides at the same time using attached balls of yarn, continue as follows. Row 1 [RS]: Work first half in pattern; BO 6 sts, work in pattern to end. Row 2 [WS]: Work as for Row 1. 17[17, 21, 21, 25, 25, 25] sts in each half. Row 3 [RS]: Work first half in pattern; BO 4 sts, work in pattern to end. Row 4 [WS]: Work as for Row 3. 13[13, 17, 17, 21, 21, 21] sts in each half. Row 5 [RS]: Work first half in pattern; BO 2 sts, work in pattern to end. Row 6 [WS]: Work as for Row 5. 11[11, 15, 15, 19, 19, 19] sts in each half. Row 7 [RS]: Work in pattern to last 3 sts of first half, dec 1 st, k1; k1, dec 1 st, work in pattern to end. 10[10, 14, 14, 18, 18, 18] sts in each half. Continue in pattern until work measures 7.75[8, 8.5, 9, 9.5, 10, 10.5] inches from beginning of armhole. Break yarn and place sts on st holders. Work as for Back until work is 1 row shorter than Back at beginning of armhole shaping (ending with a RS row). Next Row [WS]: Work 35[39, 47, 51, 59, 65, 71] sts in pattern, place marker, work in pattern to end. Note: Read ahead! Armhole and neckline shaping are worked at the same time. Next Row [WS]: Work in pattern to marker, remove marker; attach second ball of yarn and BO next 24[28, 28, 32, 28, 32, 32] sts, work in pattern to end. In the directions that follow, “first half” will refer to the set of sts worked before the gap created by the BO sts at center front. Directions for first half and second half will be separated by a semi-colon. Next Row: Work in pattern to end of first half; BO 2 sts, work in pattern to end of second half. Repeat this row 5 times more – total of 6 sts bound off at each side. Neckline Decrease Row [RS]: Work in pattern to last 3 sts of first half, dec 1 st, k1; k1, dec 1 st, work in pattern to end of second half. Repeat these 2 rows 2[2, 2, 3, 3, 3, 3] times more. Work Neckline Decrease Row. Work 3 rows in pattern. Repeat these 4 rows 3[3, 3, 4, 4, 4, 4] times more. When all neckline and armhole shaping is complete, 10[10, 14, 14, 18, 18, 18] sts remain in each half. Continue in pattern until work measures same as Back to shoulder. 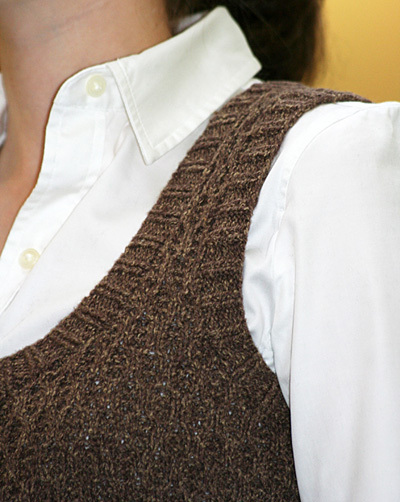 Join sts of each shoulder to sts of corresponding Back shoulder using Three-Needle Bind Off. Block to measurements shown in schematic. Sew side seams. Weave in ends. Using longer circular needle and beginning at left shoulder seam with RS facing, pick up and k 3 sts for every 4 rows and 1 st in each bound-off st around neckline edge. Place marker and join to work in the round. Count sts; in first round, decrease up to 3 sts if necessary to achieve a multiple of 4 sts. Work 8 rounds of Twisted 2x2 Rib. BO all sts in pattern. Using longer circular needle and beginning at top of side seam seam with RS facing, pick up and k 1 st in each bound-off st and 3 sts for every 4 rows around one armhole. Place marker and join to work in the round. Count sts; in first round, decrease up to 3 sts if necessary to achieve a multiple of 4 sts. Work edging for remaining armhole in the same way. Sarah is a newly repatriated Oregonian, and after three years in sunny California, she’s finally getting some use out of all her handknit sweaters. She learned to knit 10 years ago, but only became addicted when a friend introduced her to Knitty in 2004. 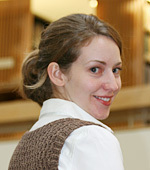 Her knitting blog is here.